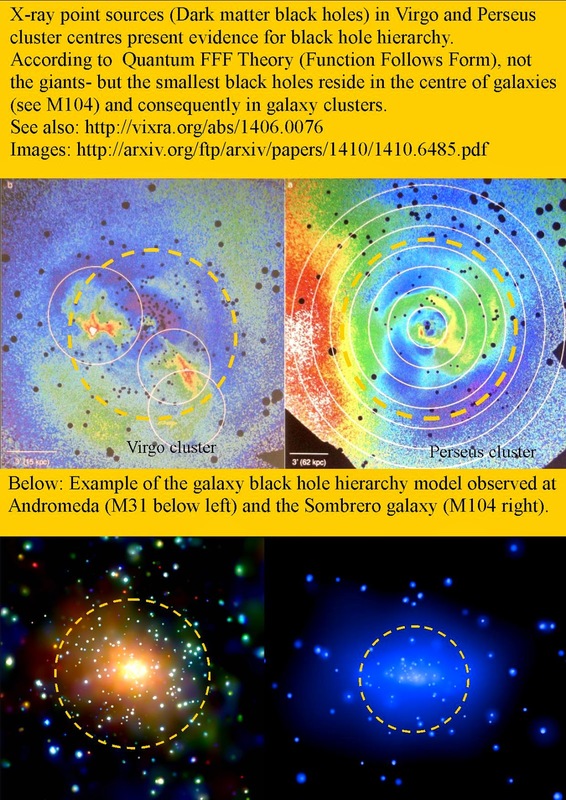 Primordial Dark Matter Black Holes outside Galaxies responsible for the creation and contraction of a Cyclic Universe?. or the idea that the universe is “closed“ and can have a beginning, and an end, however still exist forever. I will call this a closed cyclic universe and for symmetry reasons a cyclic entangled raspberry shaped multiverse based on my proposal for the Quantum Function Follows Form (FFF) model. The Form and Microstructure of elementary particles, is supposed to be the origin of Functional differences between Higgs- Graviton- Photon- and Fermion particles. As a consequence, a new paradigm splitting, accelerating and pairing massless Dark Matter Black Hole (without Graviton production) is able to convert vacuum energy (ZPE) into real energy by entropy decrease and quark electron positron production at the black hole horizon. Secondly, a Chiral dark energy Higgs vacuum lattice, is able to explain quick Gas and Dust production without large annihilation at the black hole horizon and Galaxy- and Star formation. Even microscopic black holes like Sunspots, (Micro) Comets, Lightning bolts, Sprite Fireballs and Ball Lightning seem to produce gas. However only the largest Primordial Galaxy Anchor Black Holes (GABHs) located far outside galaxies, are supposed to stop gas and dust production and by merging with other black holes they should be the ultimate origin of universal contraction into a Big Crunch and a cyclic multiverse. The Hubble redshift, in contrast with the mainstream, is supposed to originate local vacuum lattice dilution created by local dark matter black holes. All black holes eat the Higgs vacuum lattice with a local Planck length extension- as the result and the base for frequency decrease of a passing photon. As a result, GABHs are only observable by their background lensing effect and as quasi-soft x-ray sources, to be found in particular around merger galaxies, due to swirling gas and dust expelled from the galaxies. The key question in modern cosmology is how massive structures assembled in the early Universe. 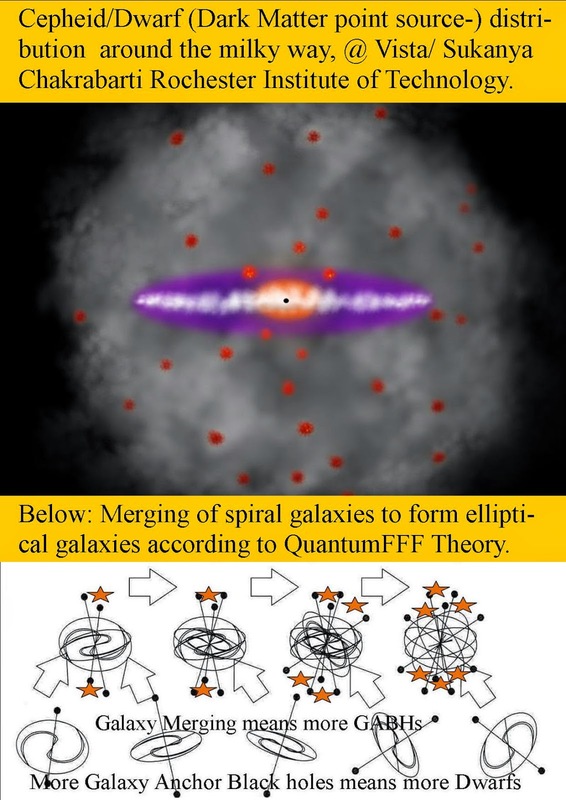 Massive galaxy clusters are born in the early Universe at the splitting points of the fractal shaped Lyman Alpha structure, according to Quantum FFF theory. 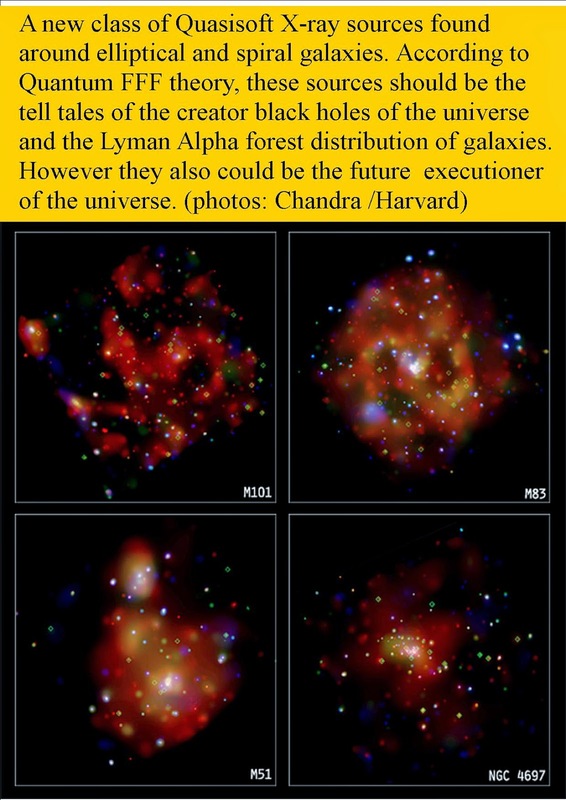 What Came Before Our Galaxy Clusters? : dark matter black hole crossings. Extract of the Quantum Function Follows Form model. 1: Black holes are the same as Dark Matter, they all consume photons, even gravitons and the Higgs field, but REPEL all infalling Fermions at a new Repulsion horizon . Positron electron pairs are produced with only few annihilation effects due to merging of positrons with Gluons into positive charged Quarks, located at the inside leaving the electrons at the outside of a globular plasma shell around the BH. 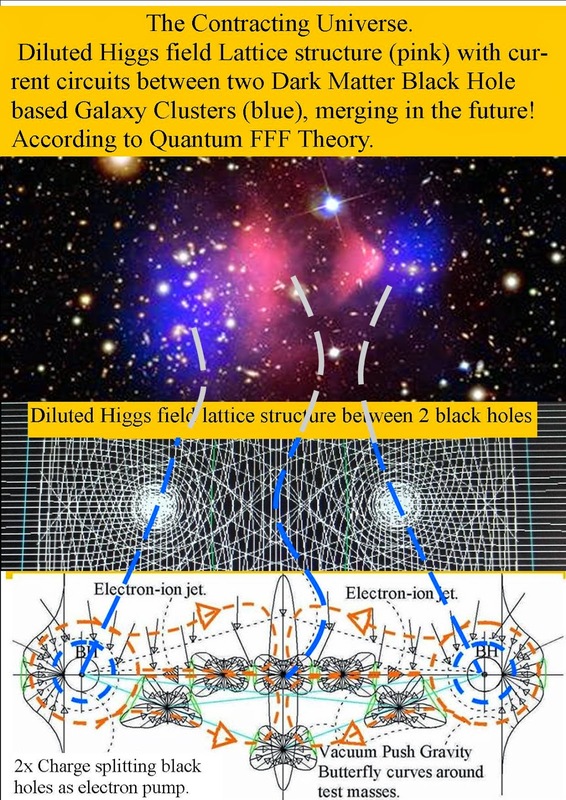 2: Dark Energy is the oscillating ( Casimir) energy of the Higgs Field equipped with a tetrahedron lattice structure and variable Planck length, which is increased around black holes by the Higgs field absorption of the BH. 3: Quantum Gravity = Dual Push gravity= Attraction (Higgs-Casimir pressure opposing Graviton pressure). 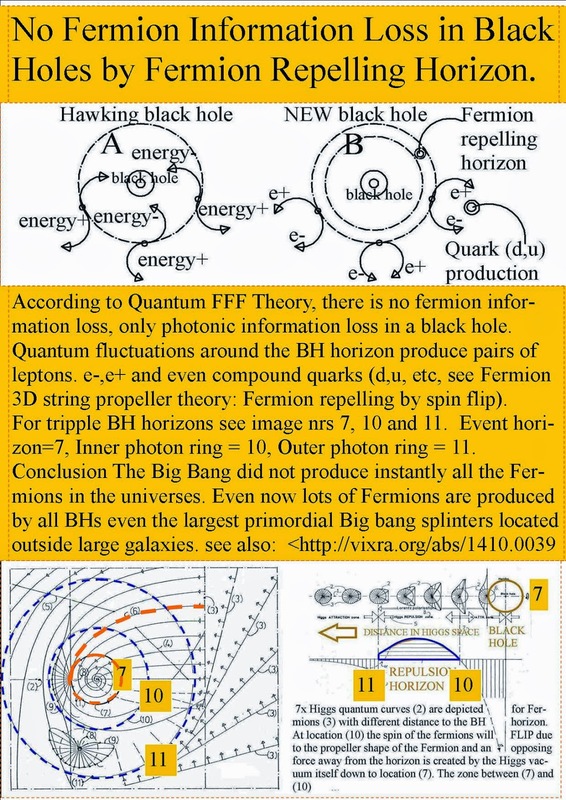 4: The Big Bang is a Splitting dark matter Big Bang Black Hole (BBBH), splitting into smaller Primordial Big Bang Splinters (PBBS) forming the Fractal Lyman Alpha forest and evaporating partly into a zero mass energetic oscillating Higgs particle based Higgs field. 5: Dual PBBSs hotspots, produce central plasma concentration in electric Herbig Haro systems as a base for star formation in open star clusters even as a start for primordial Spiral Galaxies and galaxy clusters. 8: Black Holes produce Plasma direct out of the Higgs field by pair production. Two high energy Higgs particles ( by fluctuations at BH horizons) are convertible into symmetric electron and positron (or even dual quark-) propellers. 9: The chirality of the (Left Handed spiralling) vacuum lattice is the origin our material universe. Consequently A; propeller shaped positrons merge preferentially first with gluons to form (u) Quarks to form Hydrogen, B: neutrinos are always left handed . 10: The first Supernovas produce medium sized electric dark matter Black Holes as the base for secondary electric Herbig Haro systems the base for open star clusters. 11: ALL Dark Matter Black Holes are supposed to be CHARGE SEPARATORS with internal positive charge and an external globular shell of negative charged Quark electron plasma. Even interference black holes (Ball lightning- Comets and Sunspots) seem to have the same qualities. 13. Quantum FFF Theory states that the “raspberry shaped multiverse” is symmetric and instant entangled down to the smallest quantum level. Also down to living and dying Schroedinger CATS. 15, As a consequence of 12-14, Time is always local time in combination with cyclic period time of the multiverse. 16, If our material universes has a chiral left handed oscillating Higgs field, then our material Right Handed DNA helix molecule could be explained. However it also suggests that in our opposing symmetric ANTI-MATERIAL entangled neighbour universe the DNA helix should have a Left handed spiral. According to Max Tegmark: in an entangled multiverse we may ask: is there COPY PERSON over there, who is reading the same lines as I do? If this COPY person is indeed living over there, then even our consciousness should be shared in a sort of entangled DEMOCRATIC form. 17, All particles and waves should be entangled with anti-copy particles and Higgs field based waves in our opposing anti universes. 18, Different elementary particles have different qualities by their different complex stringy shape. Leptons and Quarks have a propeller shape with left or right handed pitch creating charge difference. Gluons, Photons and Neutrino particles have no pitch. 20 All particles can be converted to one or more Higgs particles, Lepto Quarks can be compound particles. 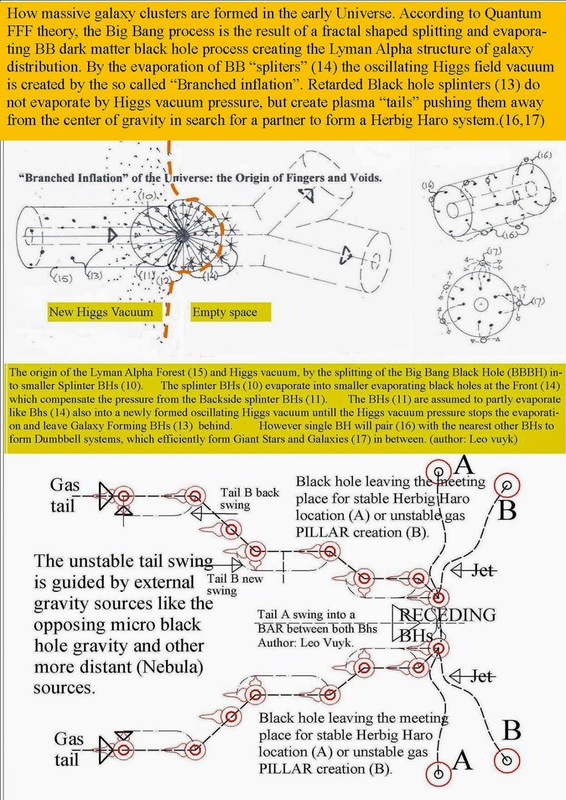 21 All particles are assumed to be present as Higgs particles already in the cyclic Big Bang Black Hole (BBBH) after the former multiverse has collapsed into a Big Crunch Black Hole. 22, We seem to live inside one material universal bubble of an instant entangled (Charge Parity Time) CPT symmetric raspberry bubble multiverse. Each quantum jump or wave function collapse or human choice is guided by this instant entanglement at long distant. The Beginning and Ending of Time. Or the idea that the universe can have a beginning, and end, yet still exist forever. I will call that the cyclic universe and for symmetry reasons the cyclic multiverse. HOW? The Beginning and End of Time. 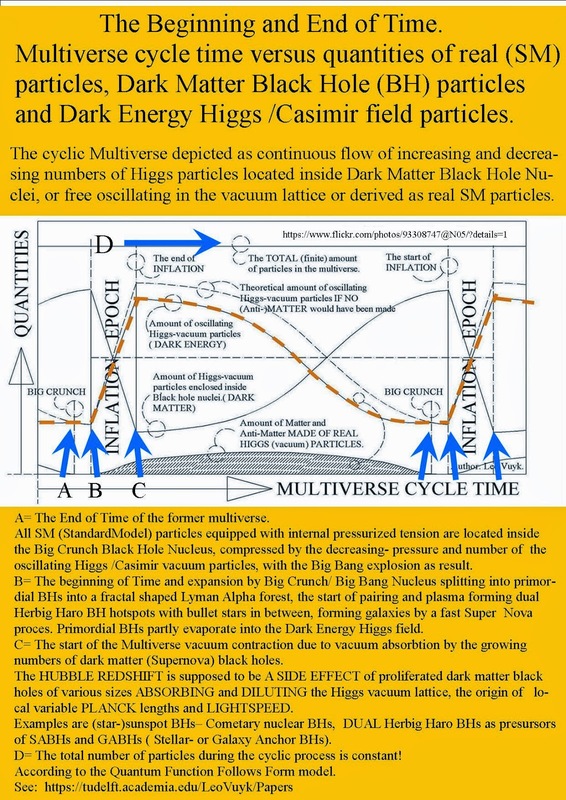 Multiverse cycle time versus quantities of real (SM) particles, Dark Matter Black Hole (BH) nuclear particles and dual oscillating Dark Energy Higgs /Casimir field particles. The entangled cyclic Multiverse depicted as continuous flow of increasing and decreasing numbers of Higgs particles located inside Dark Matter Black Hole Nuclei, or free oscillating in the vacuum lattice or derived as real SM particles. A= The End of Time of the former multiverse. All SM (StandardModel) particles equipped with internal pressurized tension are located inside the Big Crunch Black Hole Nucleus, compressed by the decreasing- pressure and number of the oscillating Higgs /Casimir vacuum particles, with the Big Bang explosion as result. B= The beginning of Time and expansion by Big Crunch/ Big Bang Nucleus splitting into primordial BHs into a fractal shaped Lyman Alpha forest, the start of pairing and plasma forming dual Herbig Haro BH hotspots with bullet stars in between, forming galaxies by a fast Super Nova proces. Primordial BHs partly evaporate into the Dark Energy Higgs field. C= The start of the Multiverse vacuum contraction due to vacuum absorbtion by the growing numbers of dark matter (Supernova) black holes. The HUBBLE REDSHIFT is supposed to be A SIDE EFFECT of proliferated dark matter black holes of various sizes ABSORBING and DILUTING the Higgs vacuum lattice, the origin of local variable PLANCK lengths and LIGHTSPEED. Examples are (star-)sunspot BHs– Cometary nuclear BHs, DUAL Herbig Haro BHs as presursors of SABHs and GABHs ( Stellar- or Galaxy Anchor BHs). D= The total number of particles during the cyclic process is constant! According to the Quantum Function Follows Form model. Wikipedia says: In theoretical physics, the Hartle–Hawking state, named after James Hartle and Stephen Hawking, is a proposal concerning the state of the universe prior to the Planck epoch. 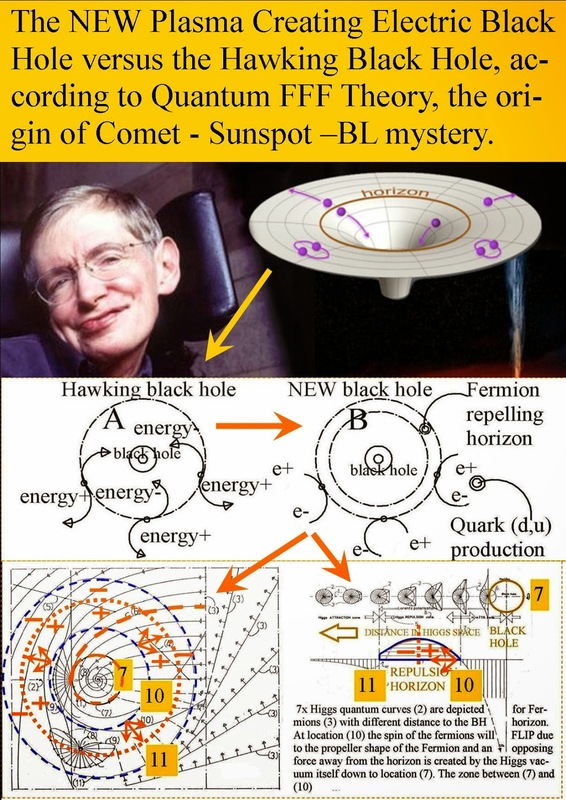 Hartle–Hawking is essentially a no-boundary proposal that the universe is infinitely finite: that there was no time before the Big Bang because time did not exist before the formation ofspacetime associated with the Big Bang and subsequent expansion of the universe in space and time. Gamma radiation from new paradigm Dark Matter Black Holes in Dwarfs. New paradigm dark matter black holes seem to be responsible for Gamma ray emission around DWARF galaxies. 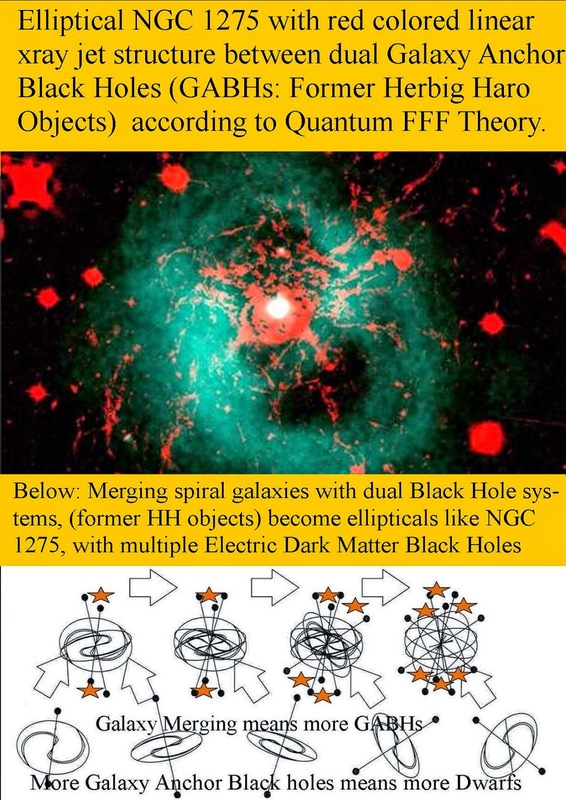 According to Quantum FFF Theory ( Function Follows Form) star formation of Dwarf galaxies is the product of cooperating dual new paradigm dark matter black holes in the form of large dual Herbig Haro objects. 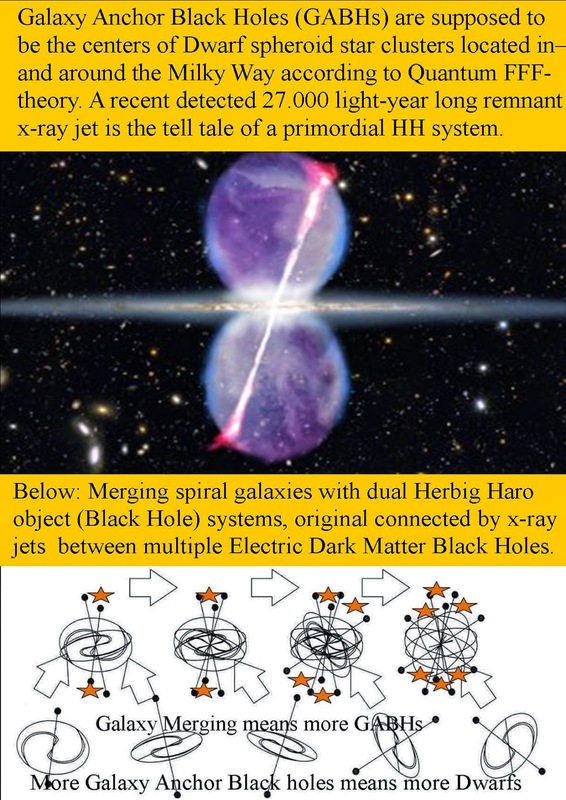 These HH objects are supposed to be the dual primordial Galaxy Anchor Black Holes ( GABHs) kept at opposing sides of galaxies by the electric pressure of a system of dual jets as often observed in HH systems. In the centre of the galaxy there is a so called White hole active, also able to attract matter but without lots of gamma rays. These new paradigm GABHs should have produced most of the gas and dust concentrated inside the central galaxy. After galaxy merging, these multiple GABHs are supposed to interact outside the central galaxy and form DWARF galaxies in between. These dwarfs have a more or less stable position outside the galaxy, dependant of the decline of the central jet pressure on the GABHs. By supernova production of small black holes inside the dwarfs, a secondary Dark Matter Black Hole system emerges inside the Dwarf, producing new gas and dust out of the Higgs vacuum with accompanied e-e+ annihilation and consequently gamma rays. Detection of gamma rays from a newly discovered dwarf galaxy may point to dark matter. 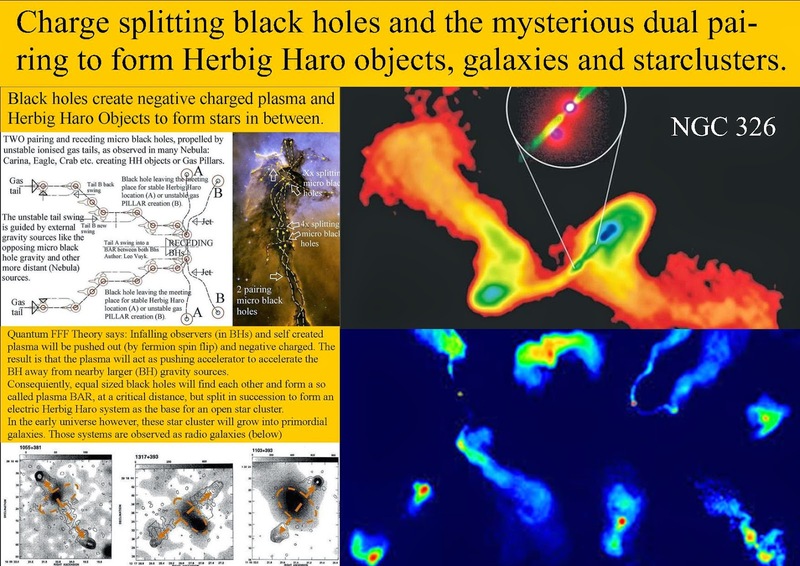 Dual Splitting and Pairing new paradigm Black Holes and the formation of Herbig Haro Objects. I think that Hawking did not calculate with the possibility of a chiral oscillating Higgs field vacuum lattice combined with propeller shaped Fermions. Electrons and positrons both pushed away from the BH horizon at different distances, forming TWO different charged separated spheres. With quark ( plasma) formation in between. ONLY if the oscillating Higgs vacuum Lattice (tetrahedral shaped) has a preferred chirality. So in our MATERIAL universe, all the Planck lattices ( the edges of the tetrahedrons) FORM A LEFT HANDED SPIRAL. As a result all neutrinos are left handed! because the neutrino information travels in the form of an Higgs oscillation along these edges. At the same time, positrons must have a preferred spin (OLO left=L) they catch a Gluon to form a u-quark ( OLO+ROR) which is better protected for the aggressive oscillations of the left handed Higgs field than an electron ORO combined with the mirror Gluon LOL forming a right handed anti- d-Quark! So New Black Holes are CHARGE SPLITTERS vi olating the 2e law, combined with a micro big bang plasma creation process! For tripple BH horizons see image nrs 7, 10 and 11. Event horizon=7, Inner photon ring = 10, Outer photon ring = 11. 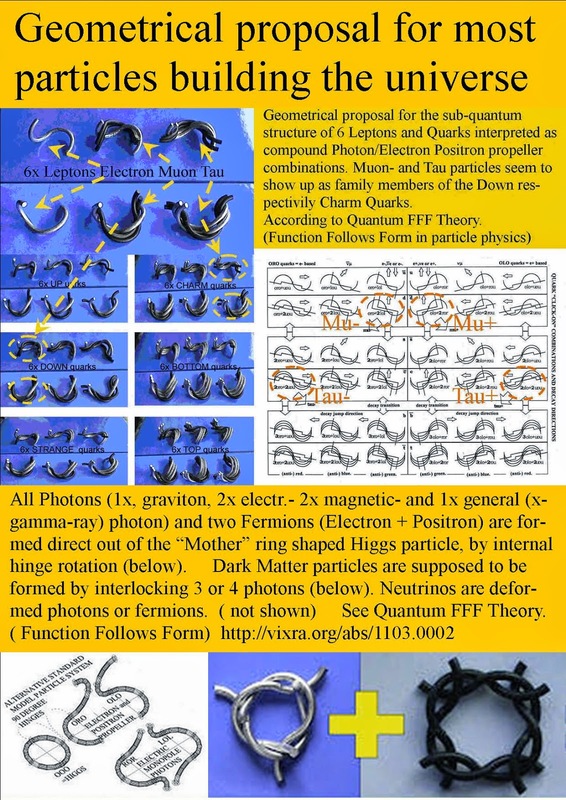 Parity and Chirality as a Base for Quark-Gluon Plasma Creating and Charge Splitting Black Holes. I am an architect who is interested in the possible sub-quantum particle FORM as information medium and building blocks in nature. Quatum Function Follows Form ( Q-FFF model) Basics. I think that Stephen Hawking did not calculate with the possibility of a chiral oscillating Higgs field vacuum lattice combined with propeller shaped Fermions. Then, due to Vacuum chirality, Electron- and Positron propellers could both pushed away from the BH horizon after spin flip polarization at different distances, forming two charged separated spheres. With quark ( plasma) formation in between. 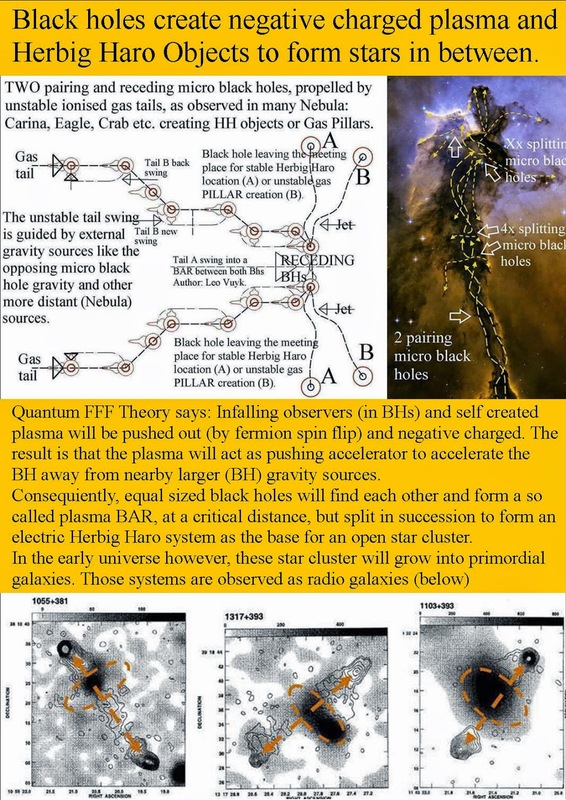 Based on such a simple object ( propeller and process) oriented ontology, Black Holes could be imagined as charge splitters violating the 2e law af thermodynamics, combined with a continuous microscopic big bang plasma creation process! 1: Black holes are the same as Dark Matter, they all consume photons, even gravitons and the Higgs field, but REPEL Fermions due to their propeller shape. They produce electric charged plasma. 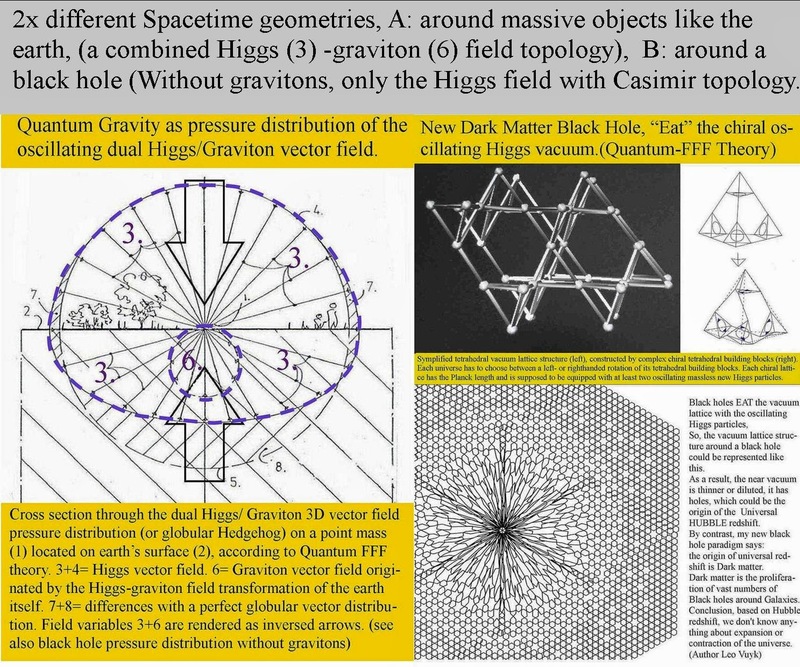 2: Dark Energy is the oscillating ( Casimir) energy of the Higgs Field equipped with a tetrahedron lattice structure with variable Planck length and consequently variable Planck Constant..
3: Quantum Gravity = Dual Push gravity= Attraction (Higgs-Casimir opposing Graviton push). 4: The Big Bang is a Splitting dark matter Big Bang Black Hole (BBBH), splitting into smaller Primordial Big Bang Spinters (PBBS) forming the Fractalic Lyman Alpha forest and evaporating partly into a zero mass energetic oscillating Higgs particle based Higgs field. 5: Dual PBBSs hotspots, produce central plasma concentration in electric Herbig Haro systems as a base for star formation in open star clusters as a start for Spiral Galaxies. 6: Spiral Galaxies will keep both Primordial Dark Matter Black Holes as Galaxy Anchor Black Holes (GABHs) at long distance. Galaxy- and Magnetic field complexity and distant dwarf galaxies . 8: Black Holes produce Plasma direct out of the Higgs field because two Higgs particles are convertible into symmetric electron and positron (or even dual quark-) propellers (by BH horizon fluctuations). 9: The chirality of the (spiralling) vacuum lattice is the origin our material universe. (propeller shaped positrons merge preferentially first with gluons to form (u) Quarks to form Hydrogen. 10: The first Supernovas produce medium sized Black Holes as the base for secondary Herbig Haro systems and open star clusters. 11: ALL Dark Matter Black Holes are supposed to be CHARGE SEPARATORS with internal positive charge and an external globular shell of negative charged Quark electron plasma. 12: The lightspeed is related to gravity fields like the earth with long extinction distances to adapt with the solar gravity field. 13. 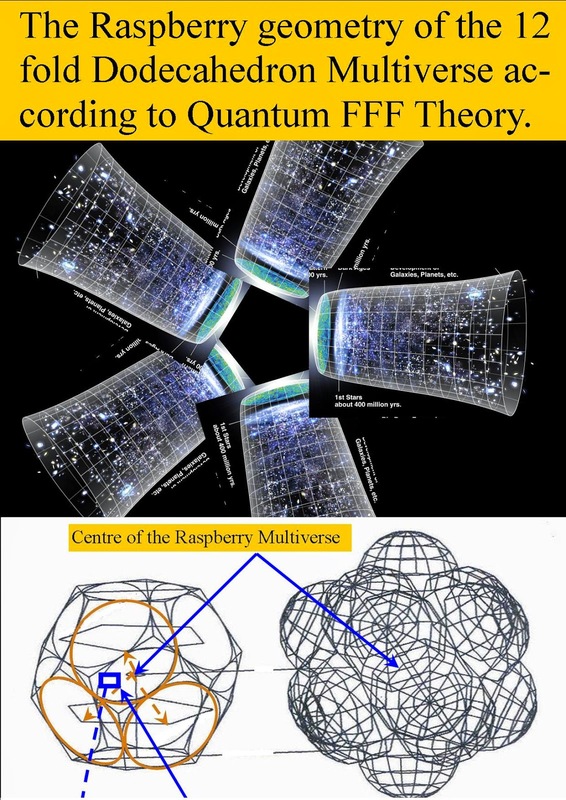 Quantum FFF Theory states that the raspberry shaped multiverse is symmetric and instant entangled down to the smallest quantum level. Also down to living and dying CATS in BOXES. If our material universes has a chiral oscillating Higgs field, then our material Right Handed DNA helix molecule could be explained. However it also suggests that in our opposing ANTI-MATERIAL multiverse neighbour universe the DNA helix should have a LEFT HANDED spiral.